NBC faces social media criticism for Olympics tape delay, but is it working? If you’re an avid user of popular social media sites, there’s a decent chance you’ve been exposed to the significant criticism that’s been leveled at NBC over its tape-delayed coverage of the Olympics. While the media giant is live streaming events online, NBC’s rationale for airing the biggest events on a broadcast tape delay is simple: it can earn far more advertising dollars by capturing prime time eyeballs. That’s important given that NBC isn’t guaranteed to make a profit from the Olympics given the costs associated with airing them. Critics aren’t convinced. In today’s always-on, always-connected world, information moves more rapidly than ever and many consumers expect real-time access to media. Tape delays are, to them, an outdated, unacceptable proposition, one that a forward-thinking media company hoping to remain successful would never stand by. But are the critics right? The apparent answer to that question may surprise you because, if you’re a numbers person, NBC’s tape delay isn’t having a negative impact on viewership. In fact, things are great according to NBC Sports chairman Mark Lazarus, who has revealed that ratings for the London Games are significantly higher than those for the Beijing Games of 2008. Prime time ratings are currently running 10% above Beijing, which is particularly notable given the fact that some of the most attractive events in Beijing were broadcast live in prime time, as MediaPost’s David Goetzl points out. So how is NBC seemingly winning with a strategy that, to many, seems so lacking? The simple answer: the assumptions some of NBC’s critics have made about tape delayed coverage may not be correct. According to NBC’s own research, the spoiler effect isn’t keeping would-be viewers from watching events when they’re aired in prime time; in fact, some viewers are actually more interested in watching a delayed broadcast when they know the results. NBC acknowledges that its coverage hasn’t been perfect, and that there’s much room for improvement and innovation. “We’re trying new things and we knew it wouldn’t be perfect and we said that before the Games,” Lazarus stated during a conference call with reporters. But for those who still aren’t convinced that NBC is taking steps forward, there’s good news: Lazarus says NBC is focused on “analyzing everything” and “really understanding the numbers and how our audience is consuming” content. In other words, it’s collecting data and analyzing it to drive key decisions. Which is essentially what digital innovators do in everything from marketing to content creation. So like where data and analysis leads NBC or not, the media company’s data-driven approach should be something many of its most vocal digital critics should be able to get behind. The Guardian and BBC’s Olympic apps: which is better? Using a second screen while watching TV is now the norm for most consumers, whether it be a laptop, smartphone or tablet. Gone are the days of sitting glued to the screen for an entire episode of EastEnders or tolerating ad breaks, nowadays viewers have other options if the action on-screen is a tad dull. Our recent report, The Multi-Screen Marketer, shows that 52% of respondents that own a television and computer are likely to be using another device while watching TV. This rises to 60% among smartphone owners. The Olympics is the perfect opportunity for brands to grab viewers’ attention with second screen apps as people will be hungry for updates and stats from other events while watching the live action on TV. 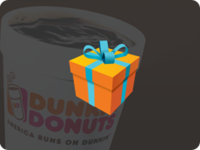 Last week, Dunkin Donuts announced that the next release of their mobile app will incorporate gifting between consumers, allowing one consumer to buy doughnuts and coffee for another, and have the details of that purchase sent to their friend’s phone for quick scanning and payment. For those of us out on the town this Friday night, the idea of getting a round in is hardly something new and certainly not something that would normally have us reaching for our smartphones, so what’s the big deal? What are the important trends in bid management technology? 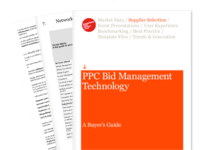 Following the release of our PPC Bid Management Technologies Buyer’s Guide, we’re continuing to share some of the insights that those working in the field provided us with in the run up to the guide.